Minerva Teichert (1888-1976), The Courting Dance, c.1936, oil on canvas, 48 x 66 inches. Brigham Young University Museum of Art, gift of The Stark Museum of Art, Orange, Texas, 2012. 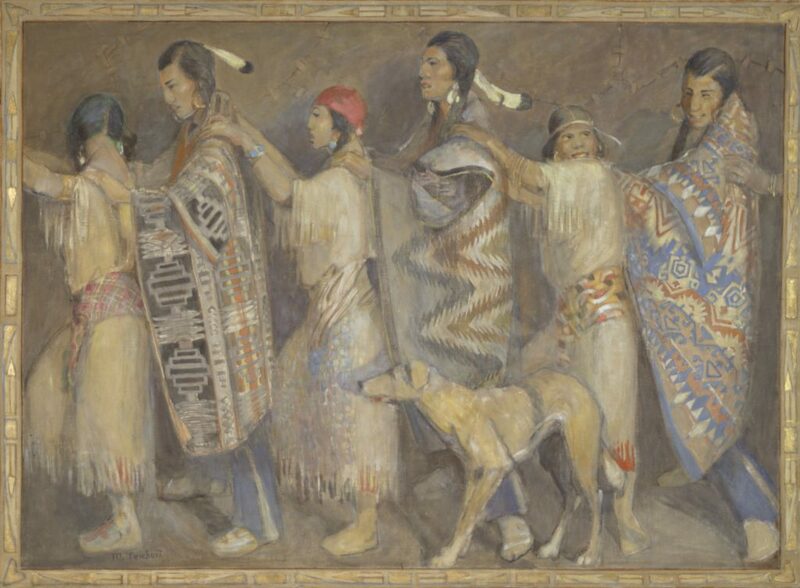 To celebrate Valentine’s Day, we feature a work Minerva Teichert painted after a ban on tribal dances ended in 1934. Her husband’s story of participating years earlier in a similar dance on the Fort Hall Reservation in southeastern Idaho inspired Teichert to paint the scene. In the dance Herman Teichert described, young men and women chose partners and danced in a circle. At the time, both tribal leaders and the Office of Indian Affairs frowned on dancing in couples. Here, the dancers wear Plains Indian attire that came to adorn all American Indians in art and in the cinema as “authentic” Indian dress.